1919: Launched by Scott & Sons Ltd, Bowling (Yd.No.278) (“Admiralty drifter”) for The Admiralty as WAFT (Ad.No.4191). 11.9.1919: Completed as a fishing vessel. 9.1.1920: Transferred to The Fishery Board for Scotland, Edinburgh for disposal. 1921: Sold to John Murray, Portessie & others (John Murray, managing owner). 1921: Registered at Buckie as GENIUS (BCK358). 1924: Sold to George Farquhar, Buckie & others (George Farquhar, managing owner). 1928: Sold to John Buchan, St. Combs & others (John Buchan, managing owner). 14.1.1928: Registered at Fraserburgh (FR299). 2.10.1939: Requisitioned for war service as a minesweeping drifter (P.No.FY.748) (Hire rate £32.0.0d/month). 11.1943: Employed on miscellaneous Naval duties. 4.1944: Re deployed on miscellaneous Naval duties. 12.11.1945: Returned to owner (David F. Cartwright MBE MC, Gorleston, manager). 1946: Sold to Adam Steam Fishing Co Ltd, London (David F. Cartwright MBE MC, Gorleston, manager). 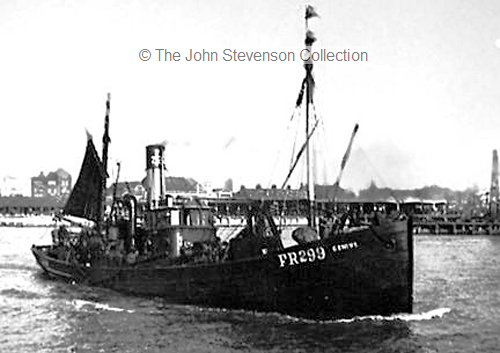 15.3.1948 – 30.6.1948: Seasonal white fish trawling from Milford Haven ((Arthur C. Mitchell, managing agent). 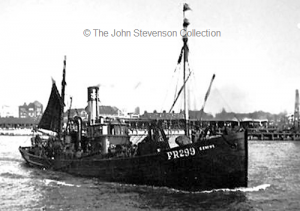 19.2.1949 – 9.5.1955: Seasonal white fish trawling from Milford Haven. 2.5.1956: After refurbishment, registered at Milford as MERCHANT VANGUARD (M46). 6.1956: On a trip to the Irish grounds (Sk. Charles Wilson); nine crew. 15.6.1956: Off the Co. Waterford coast, caught by a sudden gale and with a heavy sea running sought shelter at the back of The Hook, opposite Dunmore East. In late evening, in heavy rain and nil visibility, stranded on the Hook Peninsula, Co. Waterford. With vessel listing to port and well over, Sk. Wilson ordered the boat to be swung out and all crew abandoned. 16.6.1956: After two and a half hours with boat almost swamped sighted by Dunmore East lifeboat, picked up and landed at Dunmore East. 16.6.1956: Attempts by MERCHANT VENTURER (M49)(Sk. Ernie Smith), HOSANNA (LT167 ((Sk. A. Wiseman) and DEELUX (YH84)(Sk.Hubert Griffiths), to refloat the vessel failed. 24.6.1956: Attempt to refloat failed. 2.8.1956: Lightening, with removal of coal, stores, nets etc had succeeded in bringing the vessel upright, survey showed little damage. 8.1956: Further attempts to refloat on favourable tides failed. Subsequently declared a Total Constructive Loss and abandoned to Underwriters. (Seasonal at Milford as Genius – 15 Mar – 30 Jun 1948; 19 Feb – 25 Sep 1949; 11 Mar – 3 Sep 1950; 2 Mar – 2 Aug 1951; 18 Mar – 22 Jun 1952; 1 Mar – 19 Oct 1953; 7 Mar – 1 Dec 1954; 4 Mar – 9 May 1955; 17 Apr 1956). 19/06/2011: Page published. 7 updates since then. This entry was posted in Drifter/Trawler, Lost Vessels, Steam Trawlers, Steamers (Picture) and tagged Admiralty Drifter, Boston DSF & I, Drifter/Trawler, Lost, Parkes on July 19, 2011 by Fred Smith.